Heat oven to 375°F. Spray 13x9-inch (3-quart) glass baking dish. In medium bowl, beat eggs and 2/3 cup flour with electric mixer on medium speed until well blended. Slowly beat in 1 cup milk until smooth. Heat 8-inch nonstick skillet over medium heat. Lift pan and pour about 3 tablespoons batter into center of skillet, then tilt skillet so batter evenly coats bottom. Cook 45 to 60 seconds or until top appears dry; turn crepe and cook 15 to 20 seconds longer. Remove from skillet; stack crepes on plate. Stir batter in bowl occasionally during cooking. Repeat with remaining batter, making about 11 more crepes. In 10-inch skillet, melt 2 tablespoons butter over medium heat. Add mushrooms; cook 3 to 4 minutes, stirring occasionally, until mushrooms are lightly browned. Drain; set aside. In 2-quart saucepan, melt 1/4 cup butter over medium heat. Add 1/3 cup flour; cook, stirring constantly, until bubbly and smooth. Gradually stir in 2 cups milk, cooking and stirring until mixture boils. Boil and stir 1 minute. Reduce heat to low. Stir in dill, salt, pepper, thawed shrimp and 2 cups of the cooked mushrooms. Cook 2 to 3 minutes, stirring occasionally, until shrimp are thoroughly heated. Place 1/3 cup shrimp mixture on each crepe; roll up and place in baking dish. Cover tightly with foil; bake 20 minutes. Uncover; bake 5 minutes longer. Reheat remaining mushrooms over low heat 2 minutes. 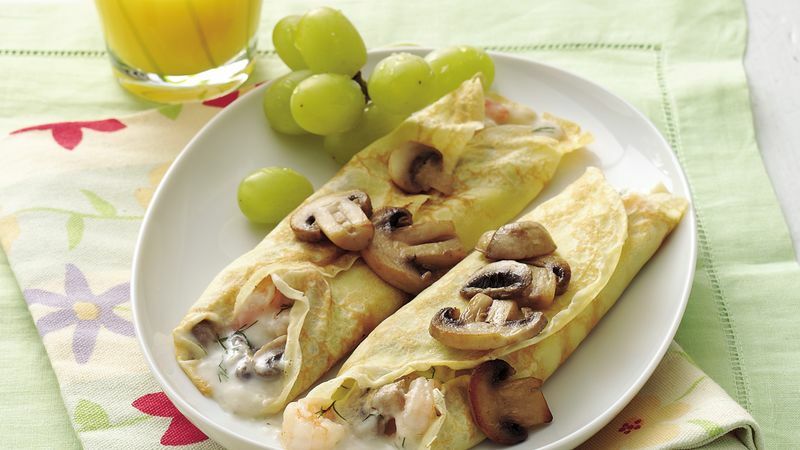 Serve crepes topped with mushrooms and if desired, garnished with fresh dill sprigs.